Bruce Godfrey will teach the course “Unemployment Appeals – Law, Practice and Procedure” at Solo Practice University®. Bruce Godfrey practices in unemployment benefits litigation, wage and hour claims and traffic and criminal defense throughout Maryland’s metropolitan core. His practice has become recognized as one of the leading unemployment litigation firms in Maryland through its innovative online marketing and informational outreach techniques. 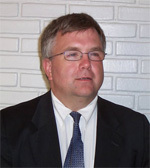 Bruce has been practicing law in Maryland since December 1994. His practice has adopted a “human-centered law practice” mission that governs the firm’s areas of concentration, client selection policies and office practices while using current technology to stay even with, and advance ahead of, larger opponents with greater financial means than his individual worker clients. Bruce is a graduate of the University of Maryland School of Law and of Princeton University. He lives and practices in Owings Mills, Maryland and is the father of two boys, Sam and Noah. Bruce is a die-hard Ravens fan and remembers the Orioles of his youth with wistful fondness.